The Greenstar Elite Slow Juicer unleashes the very best nutrition that nature has to offer, utilizing advanced bio-ceramic, magnetic Jumbo Twin Gears to get the most nutrients and juice-yield from your produce. 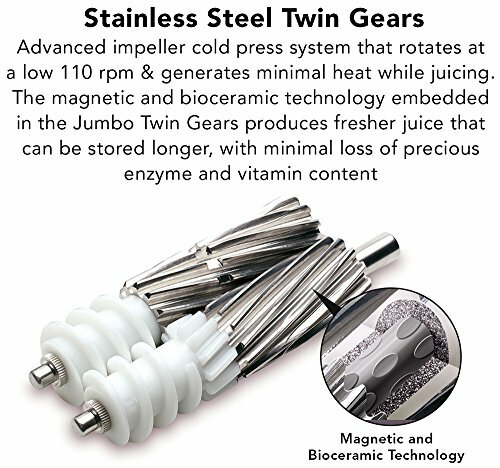 The unique shape and properties of Greenstar Elite’s Jumbo Twin Gears extracts more juice and performs better than other Twin Gear, centrifugal, or cold press juicers. The Greenstar Elite Cold-Press Complete Masticating Slow Juicer is the best twin-gear juice extractor for maximizing the nutritional value and yield from all your fruits, vegetables, and greens. 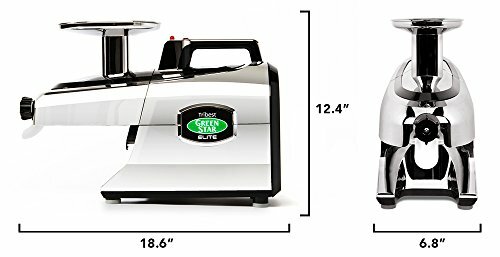 Unlike centrifugal juicers that oxidize your juice during extraction, the Greenstar Elite is a slow, cold-press juicer that works at 110 RPM, preserving the quality of your produce so you can enjoy all the healthy benefits of juicing. The unique Twin Gears are made of stainless-steel and stain-resistant nylon for durability and easy cleaning. 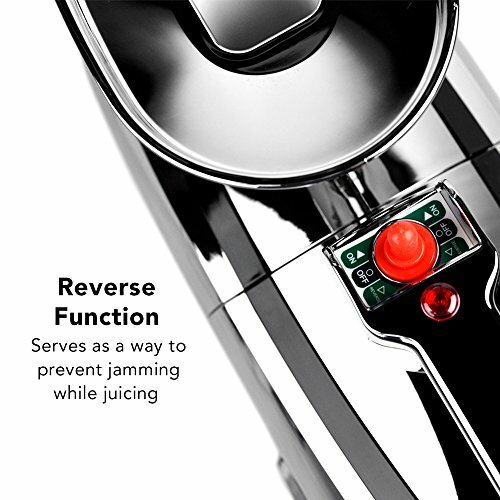 They are specially patented with bio-ceramic magnetic technology not found in other twin gear or single auger juicers that create a magnetic field as you juice, so your juice is more easily absorbed into your body and stays fresher for longer: up to 72 hours! And while other juicers claim to be masticating juicers, the Greenstar Elite Juicer truly is a complete mastication juice extractor: just as we have three different types of teeth that perform 3 different functions that begin the digestive process, the Greenstar Pro twin gears have 3 stages of mastication, making this juicer a Complete Masticating Juicer. The Greenstar Pro Complete Masticating Juicer is also U.S. commercial-certified for use in commercial kitchens, juice bars, and cafes, so you know it is durable and powerful enough to keep up with your healthy lifestyle needs. At the core of each twin gear are bio-ceramic, magnetic materials found only in the Tribest Greenstar brand of cold press, complete masticating juicers that extracts exceptional quality, nutrient-dense juices. As the gears turn during juicing, they generate a magnetic field that helps to stabilize the sensitive enzymes and vitamins in living plant cells so your juice tastes better and lasts longer – even up to 72 hours! 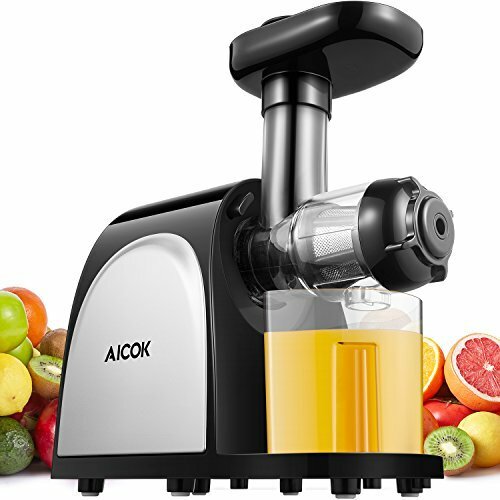 In contrast, juices made from centrifugal juicers can be stored for only a couple of hours and if made from single auger juicers, storage is possible only for a maximum of 48 hours. This innovative technology also restructures larger water clusters to smaller ones so your body can absorb all the fresh juice quickly. 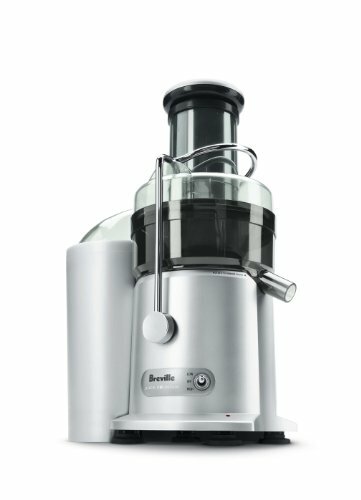 While many juicers claim to be masticating, the Greenstar Pro Slow Juicer is the only truly complete mastication juicer with its specially designed three-stage all stainless-steel twin gears. 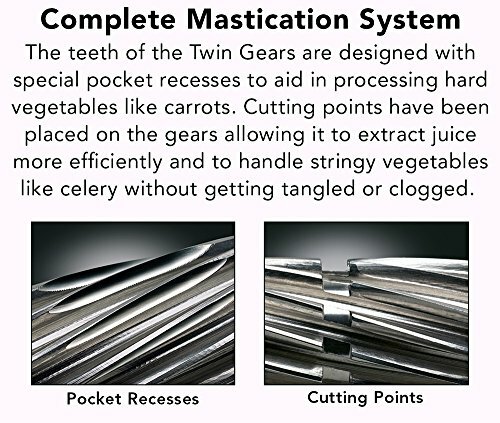 Just as there are three stages of mastication – slicing, cutting, and triturating – at a rate of about 100-120 chews per minute, the twin gears rotate at 110 RPM and has 3 specially design features – pocket recesses for slicing, cutting points to break down long stringy greens and vegetables like celery and kale, and a trituration-mixing stage at the end of each gear. This complete masticating design mimics the way nature intended our foods to be broken down at the beginning of the digestive process, so even though it is difficult to try and literally eat pounds of fruits, vegetables, and greens in one sitting, you can still reap the benefits of drinking their nutrient-concentrated juices. Juicing a whole range of fruits, vegetables, greens, and roots is easier than ever with the Greenstar Pro Cold Press Juicer outlet pressure adjusting knob. Simply turn the knob in all the way for greater pressure in the twin gear area, for harder, more fibrous produce or loosen the knob for softer, high-water content fruits. The slow juicing speed of the Greenstar Pro Juice Extractor makes juices taste better and stay fresh for up to 72 hours with high nutrient retention.Unlike high-speed, centrifugal juicers that spin at thousands of RPM which oxidize the juice even before you can drink it, the Greenstar Pro slowly presses and squeezes the juice from your produce so you can enjoy all the nutrients they have to offer. 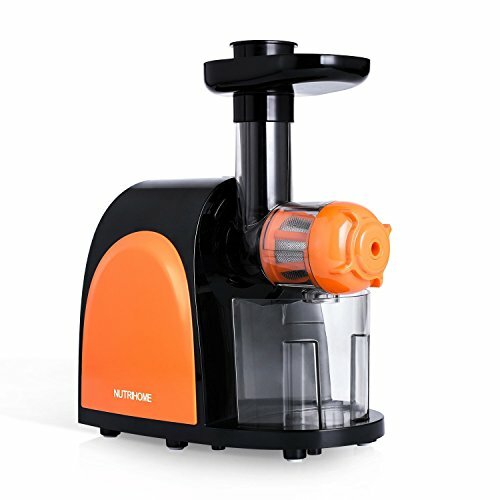 The slow juicing method with specifically a twin-gear juicer like the Greenstar Pro increases your juice yield by about 30-50%, decreasing food waste and saving money. The low RPM has the added benefit of operating quietly, so you can enjoy your juice any time of day or night. The Greenstar Pro Juice Extractor is much more than just a juicer; with the included accessories, it is also a food processor and homogenizer. Maximize your daily intake of fresh greens, fruits, and veggies by using the Greenstar Pro to make frozen fruit sorbets, fresh salsas, healthy sauces, and homemade nut butters. 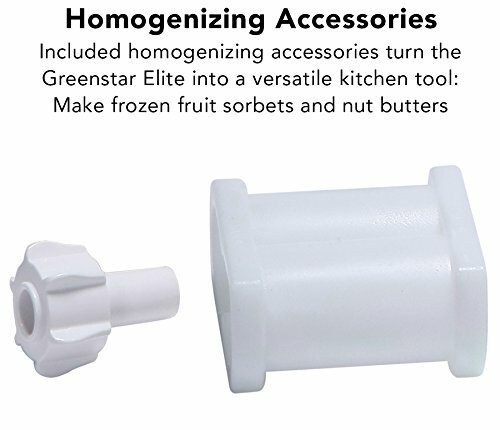 The homogenizing accessories add more value to your investment and increase the ways you can use the Greenstar Pro Juicer in your kitchen. 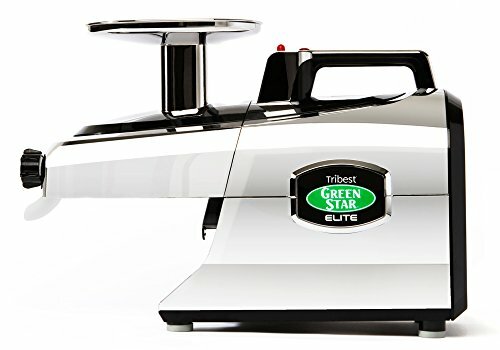 All the parts of the Greenstar Pro Cold Press Juicer are made of high quality, BPA-free plastics that are stronger and more stain-resistance that parts found in cheaper juicers, with the exception of the twin gears which are completely stainless-steel. Rest easy knowing that your juice is free from harmful BPA chemicals found in lesser quality plastics, and save time cleaning the stain-resistant parts when juicing colorful vegetables and greens. The Greenstar Pro comes with a 15-year manufacturer’s warranty for household use, and a 3-year warranty for professional use, with a dedicated Customer Service team at Tribest Corporation. The extended warranty period is a testament to the quality of the Greenstar Pro Juicer. You can be confident of making fresh, healthy juices for a long time to come.